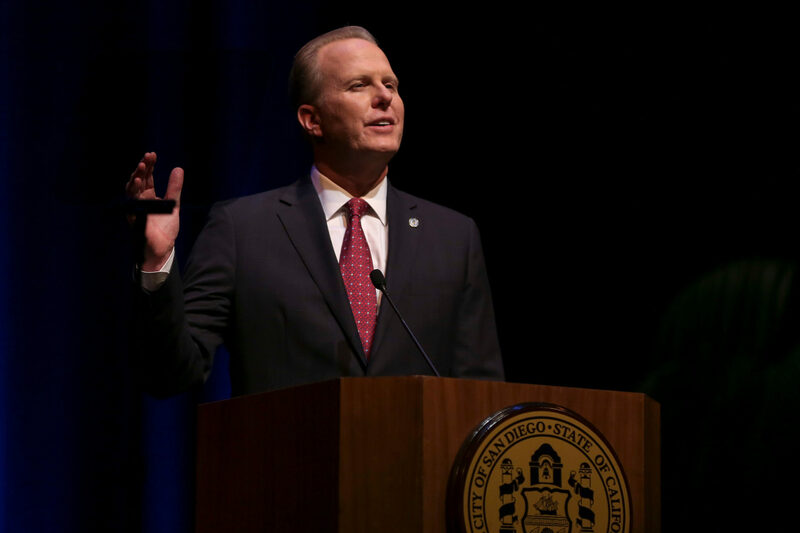 We’ve reproduced Mayor Kevin Faulconer’s State of the City speech and annotated his comments with context and links to help you better understand what the mayor said – and what he left out. What a great gathering we have tonight of our region’s elected officials, military leaders, my friends from Baja California, and neighbors from throughout San Diego. We’ve spent the past three years laying a solid foundation for our city. A city that’s fiscally responsible, governed inclusively and focused on results. A city that puts you first – with more services that matter to working families, larger investments in streets, parks and public safety, and opportunities for every neighborhood. That’s what I promised, and together, we’re getting it done. Historically overlooked communities are now getting their fair share. Southeastern San Diego needs more high-paying jobs. Now it will have its first business technology incubator. Skyline Hills had one of the smallest branch libraries. Now it has one of the largest. City Heights had one of the oldest fire stations. Now it has the newest. After years of City Hall reeling from financial mismanagement and misplaced priorities, San Diegans are finally waking up to neighborhoods that are getting the attention that they deserve. This is a different San Diego. This is a better San Diego. This is a community we proudly call One San Diego. Our region has so many exciting things on tap this year. From selecting a path to move San Diego to 100 percent renewable energy. To fighting to preserve NAFTA, protect Dreamers and expand the city’s global reach. To moving forward with Pure Water San Diego – the largest water recycling project of its kind on the West Coast. There is plenty to look forward to in 2018. Tonight, however, I want to take a different approach from past State of the City speeches. I want to have a candid conversation that focuses on the biggest challenges facing our city and what we’re doing differently to fix them. Homelessness. Housing. And quality of life. Last year, I learned firsthand the old ways of tackling these issues don’t work anymore. So we are embracing new ideas and taking new approaches. Just like we did in response to an unprecedented public health emergency. We rallied together to beat back hepatitis A. Sanitation crews led one of the most aggressive cleanup efforts in San Diego history. Paramedics scoured riverbeds and hiked canyons to deliver vaccines. And nurses went door-to-door to administer shots. In just a few months, over one hundred and sixteen thousand people were vaccinated. Still we must remain vigilant. Our public safety personnel, City and County employees, hospital workers and medical professionals continue working every day to keep our region healthy and safe. These men and women made the difference. How we react to challenges like these reveal our community’s true character. In the face of misfortune, San Diego’s compassionate, creative, and collaborative spirit shined through. We showed that we can handle anything that comes our way. The state of our city is strong, stronger than any challenge we face, and strongest when we stand united. I see people from different backgrounds in this room joined together in a shared love for our great city. That matters – because we are navigating through one of the most politically divisive times in our nation’s history. We need San Diego’s traditional culture of collaboration now more than ever. We cannot let partisan dysfunction derail our progress. There is too much at stake to let petty political posturing overshadow the public good. A safe city. A clean city. A city of opportunity. Nowhere do these aspirations align more closely than in addressing our homeless crisis. Everyone agrees that we need to do more – and that’s where the agreement ends. Everybody wants more homeless services, but nobody wants homeless services in their neighborhood. For decades, local leaders – myself included – have taken the same approach to homelessness. We pursued universal consensus while homelessness continued to rise. We tried to please everyone at the risk of helping no one. Let me be clear: Things are different now. For individuals who refuse shelter and services. For criminals who hide among our homeless population. These are not options in our city anymore. We must reduce homelessness, not enable it. We must end suffering, not condone it. We must punish crime, not ignore it. America’s Finest City will no longer tolerate the use of a sidewalk, a riverbed or a tarp as a home. Do not confuse our resolve with a lack of compassion. For those without a home trying to lift themselves out of extreme poverty, our city is ready to help by providing services with dignity. There’s a place for you, and it’s not on the streets. Our strategy is to Connect, Support and House. Connect people to our care network with temporary relief from the streets. Support them with services and workforce training. And help them find a permanent home. In October we opened a Transitional Camp Area to connect homeless men, women and children to a better life. The morning the camp area opened, I met mothers and fathers with small children in tow, drained after countless nights on the streets and the constant worry over their family’s safety. I returned a couple weeks later to find those worries fading. Parents were helping kids with homework. Children were playing video games on a donated TV. A sense of stability had returned to their lives. For those families, everything had changed. And tonight every one of those 24 families and 57 children have now moved into a permanent home they can finally call their own. Helping those families has strengthened my resolve – and confirmed that we are on the right path. So this year we’re ramping up our services with three new Bridge Shelters, which serve up to 700 people each day with more than just a bed. The shelters provide job training, mental health services, substance abuse counseling, and housing navigators to help them find a permanent home. We need to Connect, Support, House. One of the first people to enter our Bridge Shelters was Lynnette, a 51-year-old woman who had been homeless since the age of 12. Imagine that. Being without a home for practically your entire life. Yet just last week, because of the support she received, Lynnette moved into the first real home she has ever known. We have added 15 outreach ambassadors who are walking the streets to build relationships – and trust – with homeless individuals to connect them to new homeless services we were lacking before. For example, this spring we’re opening a new storage facility where homeless individuals can securely place their belongings so they can visit treatment clinics, attend school, interview for a job or go to work. Just as importantly this will help clear our public spaces of shopping carts, tents and debris. A big flaw in the system is that San Diego doesn’t have a universal entrance point to access homeless services. A homeless individual can spend days – even weeks – going from one service provider to the next before they find one that specializes in addressing their specific challenge. We’re fixing that with the city’s first Housing Navigation Center – a permanent indoor facility that will serve as the anchor to our entire care network and as a model for the region. It will be the starting point for each person’s journey to permanent housing. Trained professionals will pair individuals with an organization that has the right tools to help. Finding a location for this life-changing facility could have – once again – resulted in an endless search for consensus that doesn’t exist. But like I said – we’re doing things differently now. I’ve decided on a downtown location at 14th and Imperial. And I’m excited to say that we are ahead of schedule – and the Housing Navigation Center will open this year. We must Connect, Support, House. Housing supply, of course, is the key to it all. With our Housing Our Heroes program we’ve unlocked a great way to get people into apartments. Working with the Housing Commission and the business community, I’ve encouraged landlords to open their doors to over one thousand homeless veterans. It’s been such a success that we expanded the Housing Our Heroes program to all homeless individuals – with enough funding to house three thousand men, women and families. This is how we get San Diego’s homeless into permanent housing now. I’ve outlined a “Housing First” plan – but not a housing only plan. Its foundation is a comprehensive ecosystem – with solutions as diverse as our homeless population. As I said before, there’s a place for you, and it’s not on the streets. If you have nowhere to sleep, shelters and safe parking zones are open. If you have an addiction, want to reconnect with family, store your belongings or find a job, supportive services are available. If you can’t find an apartment, housing experts will help. And if you still aren’t sure where to turn, a navigation center will guide you. We will Connect, Support, House. Ladies and gentlemen, this is how we will reduce homelessness in San Diego. Tonight I’ve outlined a number of actions our city is taking. Nearly 40 percent of the county’s homeless population is outside the city limits. That’s why I’m calling on leaders from throughout the county to join us in taking a new approach. Our region needs more homeless services. Our region needs more bridge shelters. And our region needs more of our leaders to take action. We’re either going to succeed or fail together. So many people have already stepped up as essential partners in our efforts to reduce homelessness. Councilmembers Chris Cate, Chris Ward and Lorie Zapf, who are each welcoming new homeless services to their districts. City Attorney Mara Elliott. Supervisor Ron Roberts and the Regional Task Force on the Homeless. The San Diego Housing Commission and its President Rick Gentry. City staffers Casey Smith and Jasiah Neff who moved mountains to get the camp area and bridge shelters open quickly. And each of our eleven thousand City employees – because this has truly been a citywide effort. Our homeless service providers – Alpha Project, Veterans Village of San Diego, Father Joe’s Villages, Dreams for Change and Jewish Family Service of San Diego. Philanthropists Peter Seidler, Dan Shea, and Pat and Stephanie Kilkenny. The hundreds of landlords – some here tonight – who joined the Housing Our Heroes campaign and are giving so many homeless San Diegans the chance to sign a lease and rebuild their lives. We didn’t have this level of cooperation and coordination a year ago. Reducing homelessness is truly a region-wide effort – and it’s going to take all of us working together to get the job done. I want to simply say: Thank you. Thank you. Thank you. Lack of housing isn’t just a problem for the homeless. California’s housing crisis affects all of us. The neighborhood barber, the mechanic down the street, the barista at your favorite coffee shop. All San Diegans are paying more to rent an apartment or buy a home – leaving less money for basics like buying groceries or filling a prescription. The median price for a home in San Diego is shattering records. And experts warn that rising housing costs pose a significant threat to our economy. Make housing more affordable, cut bureaucratic red tape, promote smart growth, and build more homes for hardworking San Diegans. We changed city codes to streamline project reviews – shaving months off the approval process. We reduced fees for projects that are 100 percent affordable housing. We authorized over fifty million dollars last month to finance more affordable housing for families, veterans and chronically homeless individuals. And we made it easier and cheaper to build a second, smaller dwelling unit behind your house or above a business – resulting in a 375 percent spike in applications. This year we’re going to change our outdated parking mandates for projects near transit centers to reduce development costs and greenhouse gases. I will send legislation to the City Council to revamp fees so developers are encouraged to build smaller units that people can actually afford. We’re going to create more live-work opportunities through zoning changes across the entire city. And expand our award-winning affordable housing development program to incentivize more housing for San Diego’s middle class. This represents a sea change in how San Diego deals with housing. Countless government regulations have been created around the premise that more housing is the cause of our problems. But more housing is a solution to our problems. The key to the homeless crisis – is more housing. The remedy to reduce greenhouse gases – is more housing. The engine for San Diego’s continued economic growth – is more housing. I want every builder, every construction worker, every contractor, to hear me loud and clear: If you’re in the business of building homes, we want to put you to work! A healthy city is built around safe neighborhoods. San Diego is one of the safest big cities in the country. Overall crime is at its lowest point in half a century. However, we can never take that for granted. There are over two hundred open positions in the San Diego Police Department right now – and for years we haven’t been able to attract enough recruits to replace the veteran officers who leave or retire. It’s led to heavy workloads and stress – and could turn into a public safety crisis if we don’t act now. I made a pledge to rebuild and grow our Police Department. It’s why last month I was proud to have authored – and delivered – the largest recruitment and retention package in San Diego police history. Imagine the improved quality of life in our neighborhoods if we had two hundred more officers out there walking the beat. More officers responding to calls. More officers getting to know you and your neighbors. More officers stopping crime before it starts. I thank the City Council for supporting this new police contract. It will make SDPD competitive with other law enforcement agencies – and help us bring in the next generation of officers who will keep us safe. Although the ink on the deal is barely dry, applications are already up. Retirements have slowed. And some officers who had left our department have already returned. It’s good news, and it’s just the beginning. This year I will launch an aggressive, national recruitment campaign to encourage men and women from throughout the United States to join the SDPD. We will show America’s best and brightest that there is no place better to serve than San Diego. And when we’re done, for the first time in over a decade, we will have a fully staffed police force! One of my first decisions as Mayor was to appoint Shelley Zimmerman as the first female police chief in San Diego history. We needed someone to lead with integrity and the highest ethical standards – and Chief Zimmerman was the right person for the job. She has led the department with strength, professionalism and a focus on community policing. Chief Zimmerman is retiring in March after an illustrious 35-year career. Chief, on behalf of a grateful city, we thank you. Our next police chief will work to keep our city one of the safest in the nation, working with a great partner in Fire-Rescue Chief Brian Fennessy. Our firefighters protect lives and property each and every day. Their heroism extends beyond our city. They deployed to hurricanes in Texas and Florida. And fought fires up and down our state. I’d like to ask all of our active and retired public safety personnel – our firefighters, our lifeguards and our police officers – to please stand for a moment and be recognized. I want to spend the rest of our time tonight talking about what we’re doing differently to fix our neighborhoods – and clean them up. Not too long ago, I stopped by Encanto to check in on some road repairs. An elderly resident walked outside to say thanks and admire his new street. He paused, looked me in the eye and said something that stuck with me. He was just standing there, beaming from ear to ear – like he had just won a million bucks. This simple thing – this routine community improvement – had returned a sense of pride to his neighborhood. This is why I’ve made street repair a top priority. They told me it would take a complete overhaul of our infrastructure program and a significant increase in funding. We reformed the entire system to finish projects faster, use taxpayer dollars more efficiently and move shovel-ready projects to the front of the line. This wouldn’t have been possible without support from City Councilmembers Mark Kersey and Scott Sherman, who made infrastructure and fiscal reform top priorities. Four years ago, the City was investing about one hundred eighty million dollars a year in neighborhood improvements. Now we invest nearly half a billion dollars each year. A decade ago the City only repaired twenty five miles of streets in an entire year. Now that’s about how much we fix in a month. Years would go by between the construction of new parks, fire stations and libraries. Now projects are happening throughout the city. Last month we opened the new Torrey Meadows Neighborhood Park that replaced an empty dirt lot. Next week we’ll open new skate parks for kids in Mid-City and Linda Vista. And tomorrow we’re breaking ground on a project that San Ysidro residents have been championing for years – a brand new library! These neighborhood improvements matter to people; they’re about quality of life. A healthy community and a clean environment are part of San Diego’s DNA. It’s why I recently launched “Clean SD” – a citywide effort to remove trash and debris that has been piling up across our city. People deserve clean public spaces. We can’t allow litter in our communities. We can’t allow garbage on our sidewalks. And we can’t allow trash to line the San Diego River and our canyons. So I’ve redirected and added resources to clean it up. Crews have already removed more than 700 tons of trash in just six months. This aggressive, sustained approach is the new normal going forward – and we need everyone to do their part. We are going to clean up our communities. We are going to scrub graffiti from our streets and sidewalks. And I won’t rest until we restore the San Diego River to its natural beauty! The deliberate underfunding of the pension system by past city leaders left us with a massive deficit that we’re still paying off today. It means one hundred million dollars each year goes to pay off those mistakes of the past rather than invest in the future of our neighborhoods. That is why all of the priorities we discussed tonight need significant attention. That’s only going to be possible if we show the same discipline that helped turn city finances around. The fiscal reforms I’ve championed my entire career have kept us on a strong financial footing. We have healthy credit ratings and solid revenue growth. I have made sure that we are putting money away for a rainy day – and we now have the largest reserves in city history. Yet we must remain vigilant and make responsible decisions this year built around our priorities. And with the City Council’s support, we can keep our finances healthy. While the future of global markets and the national economy is unpredictable, there is one economic lever we San Diegans directly control. And there is one significant action we can take this year to ensure our local economy continues to grow. One decision that will provide the substantial resources that we need to tackle the tough challenges I’ve outlined tonight. The expansion and modernization of the economic engine that is the San Diego Convention Center. The City Council majority wasn’t quite ready to act last year on my plan to grow the convention center, expand our economy and create the first dedicated funding streams for homelessness and road repair. Fortunately, a broad coalition of San Diegans recognize the benefits of this plan, and are taking this vision forward to the November ballot. This unprecedented coalition includes leaders from the lodging and tourism industry, the San Diego and Imperial Counties Labor Council, the San Diego Regional Chamber of Commerce, and leading homeless service providers. These groups rarely talk to each other, let alone partner with each other. Yet they are setting aside their traditional differences to launch a ballot initiative for the greater good of our city. This initiative will be the most important decision before voters in November, and I will work tirelessly with the coalition to get it passed. The convention center expansion is the single most effective way to strengthen our economy. It will create jobs, spur development, ensure future prosperity for our region, and help meet the growing needs of great conventions like San Diego’s own Comic-Con. This plan will benefit every single San Diegan – regardless of whether you ever set foot inside the Convention Center. More economic activity fueled by a bigger convention center means more revenue for our city. That means new fire stations, new parks and new streets, from Rancho Bernardo to Otay Mesa and Pacific Beach to San Carlos. All of that would be enough for many to say yes, but this is about so much more than a Convention Center expansion. The proposed ballot initiative would also generate billions to pave our roads, build more housing, and help our homeless population. This is the missing piece San Diego needs to ensure we have enough housing and services to tackle our homeless crisis. The benefits are real – and I’m so excited that this bipartisan group of civic leaders is helping us to get this across the finish line. This year we can take three of San Diego’s biggest challenges and turn them into San Diego’s biggest successes. Success for our local economy. Success for our most vulnerable residents. And success for our neighborhoods. Over the past few years we’ve focused on restoring neighborhood services and rebuilding our communities after years of neglect. We became a city that fixes its roads. A city that invests in its parks and libraries. A city that keeps its communities safe and its financial house in order. But San Diegans are asking their city to do even more. To take on the deeply complex problem of homelessness. To make housing more affordable for working families. And to ensure our quality of life is second to none. This will require new ideas and new approaches. Tonight, after we leave this theater, I want us to think about those 24 families from the campground who now have a safe bed to sleep in and a home to call their own. If we had continued to listen to the naysayers; if we had let perfect be the enemy of good; if we had done things the way they have always been done before – where would those families be right now? We took a different approach – and lives were changed as a result. San Diego is on the right path – and we have plenty more to do. So I will be demanding more of myself. More from our civic and community leaders. More from every person in this room. Because it’s going to take all of us working together to get it done. Thousands of struggling San Diegans will be connected to permanent housing. The number of housing units built in our city will be on the rise. The San Diego Police Department will be fully staffed for the first time in over a decade. And the modernization and expansion of the Convention Center will be underway. Reaching those goals won’t be easy – nothing worth doing ever is. It will try our patience. It will test our strength. It will challenge our resolve. And it will bring us closer together. We will show that when San Diego stands united, we can accomplish anything. We can – and we will!